888poker’s May super series XL Inferno is right around the corner. The series, which takes place from May 10-20 consists of 34 events guaranteeing a total of nearly $3 million. Then, to wrap the high-powered event up, there will be a $1,000,000 guaranteed Main Event. In anticipation of players battling it out win XL Championships, here are some PocketFivers to keep an eye on heading into the series. Having found success on 888poker during the month of April, these players hope to continue their winning ways during XL Inferno. Former Worldwide #1-ranked player from Sweden Anton ‘VnilaVader’ Herrmann cashed six times on 888poker in April. His runner-up finish in the April 22 edition of the $100,000 Whale gave him one of the largest cashes of the month, netting him $23,845 for his efforts. In total, ‘VnilaVader’ won roughly $30,000 on the site in April. 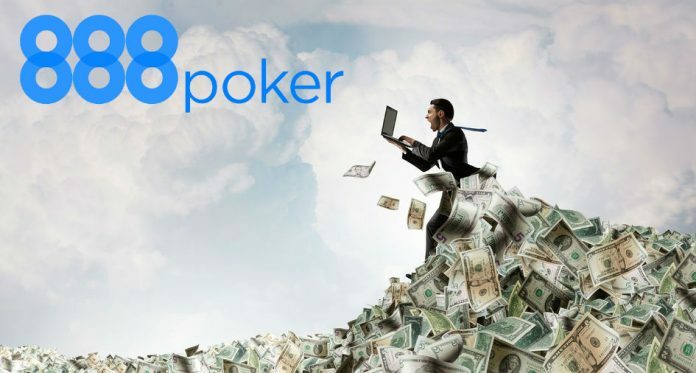 That was good for the top spot in big winners on 888poker for April. The total leaves him less than $15,000 shy of the major milestone of $4 million in lifetime earnings. Though Brazil’s ‘JoaoMarcos’ didn’t put in a ton of volume online during April, the times he did play he really made count. That includes the three podium finishes out of his five 888poker cashes. What really sealed the deal for a successful month was his runner-up finish in the $100,000 Whale on April 1. The payout was no joke, a whopping $20,400 added to his bankroll, setting him up for a solid XL Championship series. Top 100 player, Russia’s ‘AloofRevolver’ (aka ‘CalmRevolver’) also found recent success on 888poker. The Worldwide #86-ranked player destroyed the $215 buy-in $100,000 Sunday Mega Deep tournament on April 22 for over $19,000. Four days later he tacked on another victory, taking down the $10,000 Thursday Cube for $3,250. His April helped push him up over $100,000 in lifetime earnings on 888poker and over $1.2 million in total. Another player to watch is Moscow, Russia’s ‘papan9_p$’ (aka ‘sweet_Dr34ms’). A Worldwide top 50 player (#45) ‘papan9_p$’ racked up 12 cashes on the online site in April. His efforts were headlined by his victory in the April 8 edition of the $15,000 Turbo Mega Deep which brought him just under $5,400 for the win. A regular at both mid-stakes and higher buy-in tournaments, it’s very likely that Russia’s #6-ranked player will be in the mix just about every day during the series. Sweden’s ‘machiavelli3’ (aka ‘cuadrado12’) found himself at nine final tables on 888poker during the month of April. The longtime grinder and Sweden’s #14-ranked player topped a field of 140 players in the April 11 edition of the $15,000 GREAT 8 for $3,584. During the month he posted four four-figure scores on the site and collect over $12,000 in earnings. It was a big part of his efforts to surpass $2.5 million in lifetime earnings, which he accomplished in April. Also of note was Finland’s #3-ranked online pro ‘Emeriaa’ (aka ‘wellyxx’) who finished in third in the April 22 edition of the $100,000 Whale for $16,240. Also, top 10 crusher from Argentina Ramiro ‘Ramiro’ Petrone (aka ‘lasochobi’) scored a pair of final table finishes in April to take home $14,500 which he will most likely fire into XL Inferno. With buy-ins ranging from as little as $5 and a High Roller of $2,600, each one of these April 888poker winners will have their opportunity to jump into the XL Inferno fire. All of the action begins on May 10 at 888poker.